Economy Minister pays condolences to terror victim's family, says response to terror needs to be unity and building in Israel. 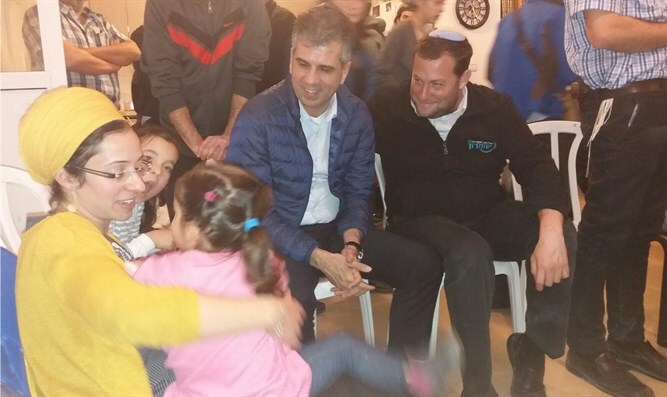 Economy Minister Eli Cohen (Kulanu) on Thursday night visited Har Bracha to pay condolences to the family of terror victim Itamar Ben Gal. Ben Gal, 29, was murdered on Monday at the entrance to Ariel. He is survived by his wife Miriam and four children, the youngest of whom is six months old. Following the visit, Cohen said, "Today, I paid condolences to the Ben Gal family, and I saw the Jewish nation's strength - we are all united after this despicable murder, and we are all embracing the family." "Ben Gal's widow said something which I think we can all learn from: [We need] to continue strengthening the Land of Israel, to build here. Anyone who thinks they can subdue us is mistaken. "No one can be victorious over the Jewish nation, and we will eliminate terror. We will continue to be united, and to build the Land of Israel here in Samaria. We will strengthen the settlements, and this will be our victory over all of the lowlifes." Regarding the terrorist, Cohen said, "Security forces will reach him, just like they have in previous cases. No one should come out alive. Just like the terror victim's wife said - continue building, strengthen the land and the State of Israel. This is her request and his legacy, and we are obligated to [fulfill] it." Samaria Regional Council Head Yossi Dagan said that he expects to see additional families building their homes in Har Bracha, as a response to the terror attack. "We expect the government to approve 800 housing units for this place, so that the terrorist in Shechem (Nablus) will know that not only did he not succeed in destroying one home, there will be 800 ore homes here. They need to understand that doing these things doesn't pay," he said. "Besides for strengthening the family, we need to strengthen the nation of Israel. They need to understand, so that our murderous enemies will also understand that they achieved exactly the opposite of what they planned to achieve."